Home Renovations can be exciting and challenging experience. Adding new electrical systems to existing ones can be tricky. 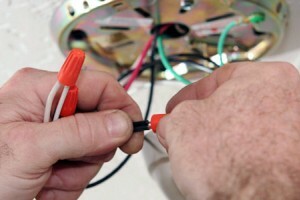 The knowledgeable staff at Bellows Electric can tackle even the most complicated electrical renovations. Relocating existing wiring, adding new wiring, upgrading electrical panels, wiring for new water heaters, adding ceiling fans, and wiring for home theater systems are just some of the many services we provide to customers who want to renovate their homes. We also provide services to businesses who wish to renovate. We can upgrade electrical wiring systems to provide for additional equipment, relocate wiring to accommodate new business layouts and provide better outdoor lighting for safety and security. Fire or water damage can be devastating. The electrical system of a home or business can sustain visible and unseen damage. Bellows Electric can help restore your business, home or outdoor environment to it's original state by detecting and replacing inoperable fixtures and faulty wiring. We can also help you make improvements to your space and turn your tragedy into an opportunity for improvements.